At the end of the unit "English: a language of many worlds", I decided to show this film, which is about the difficulty felt by two rich American girls in learning and speaking Spanish while adjusting to a poor life. 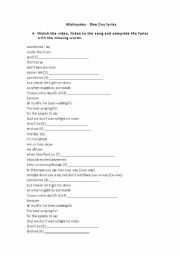 In this worksheet, students will revise some vocabular and verb tenses. The song ´One Day´by Matisyahu can be used as a listening lead in activity to the topic "Cultural Diversity" and "Discrimination". This powerpoint was used just to make a revision of comparatives and superlatives. I did it, so that students placed in a class which is more advanced than them could have an aid in the Moodle platform. 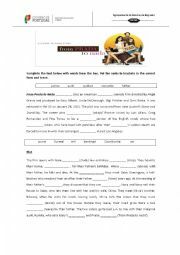 A clear revision of past tenses.